According to a report recently released by The Education Trust in Washington, D.C., UC Riverside has one of the nation’s best graduation rates for black students. Nationally, black student graduation rates lag those of white students by about 22 percent. At UCR, black students graduate at a rate 1.7 percent higher than their white peers. The report analyzed data from 676 institutions and highlighted 18 — chosen for high graduation rates for black students with little-to-no gaps between black and white students. UCR was the only California-based institution to be spotlighted. 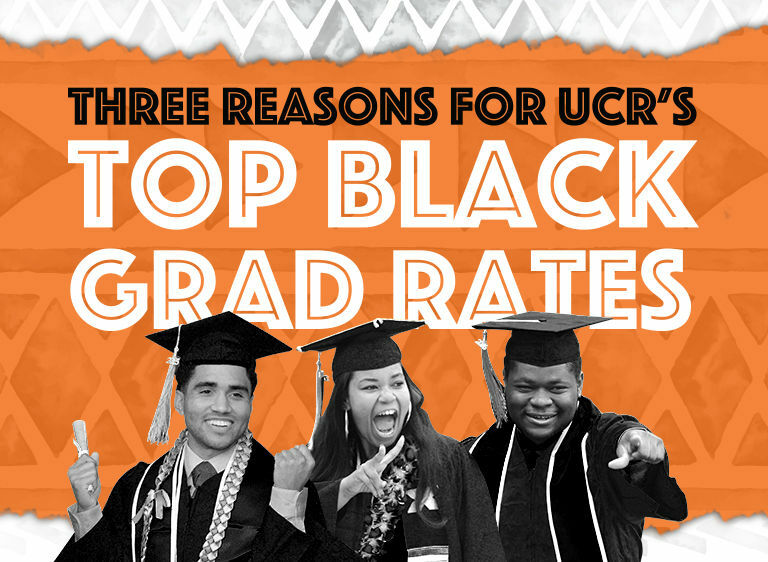 Here are a few reasons why at UCR, African American students excel. R’Home was written and produced by the students of the University of California, Riverside — specifically the students of African Student Programs TV (or ASP-TV). Directed and edited by Jared Odom. Written and performed by Gabrielle Adoh. Since 1972, UCR’s African Student Programs (ASP) has served students of African descent. ASP connects students with campus resources and advocates on their behalf, helping them to navigate academic challenges or bureaucracy related to housing, financial aid, policies, and parking. “When we eliminate the barriers, it allows our students to focus on their academic success,” says ASP Director Ken Simons ’83. Each year, ASP invites about 400 black scholars to its annual Academic Awards Ceremony, where they are recognized for making the dean’s list. The department also provides mentoring, cultural experiences, and networking opportunities. Black students feel comfortable on UCR’s diverse campus and credit their success to the support of faculty, peers, and programs. “Everyone was friendly and willing to help, the opportunities to enrich myself were endless, and the environment was one of excellence. I loved my experience at UCR so much that I decided to come back to complete my medical education,” says Queen-Ivie Egiebor ’14, now a graduate student. UCR Magazine is published by the Office of Strategic Communications, University of California, Riverside, and it is distributed free to the University community. Editorial offices: 900 University Ave., 1156 Hinderaker Hall, University of California, Riverside, Riverside, CA 92521, telephone (951) 827-6397. Unless otherwise indicated, text may be reprinted without permission. Please credit University of California, Riverside. Do you want to receive a printed version of UCR Magazine? What would you like to see in our magazine?